Figure 1. The Hueco Bolson on the U.S.-Mexico Border. Figure 5. The water demand model was incorporated in a decision support toolkit. This study links algorithms that relate historical residential and agricultural consumption of water with population growth. The algorithms were obtained from JMP/SAS statistical software package, and were programed within EXTEND visualization environment. 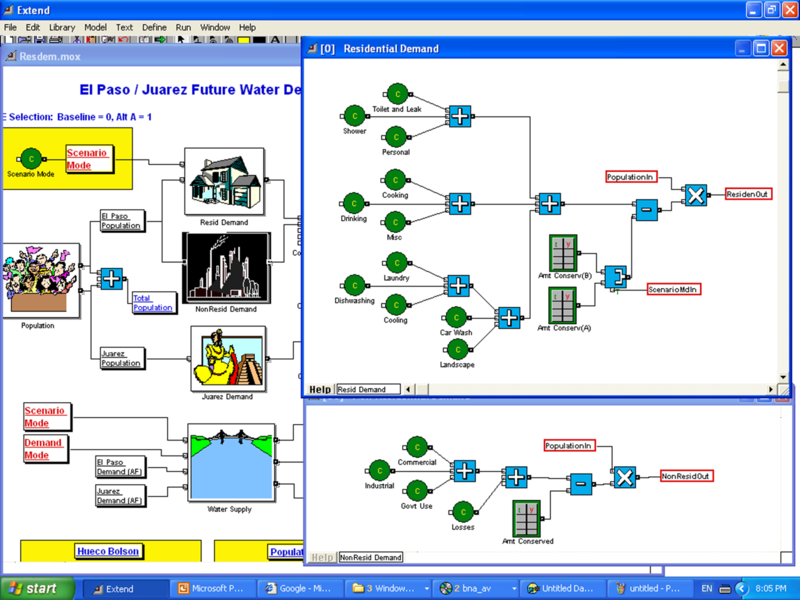 Graphical simulation was used as an approach in this study because it is a powerful tool for analyzing, designing, and operating complex water demand systems. It enables users to test hypotheses without having to carry them out. It is a cost-effective means of exploring various water demand scenarios. It is an efficient communication tool, showing how different options work while stimulating creative thinking about how it can be improved. 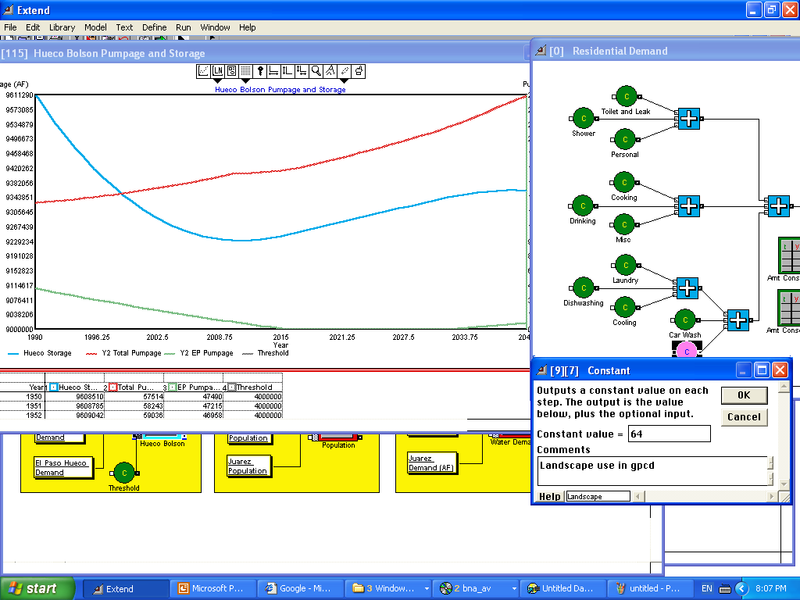 EXTEND is a modeling and simulation software which was used in this study as a tool to quantify and simulate different consumption scenarios and examine their impact of consumption on available surface and groundwater resources. It is basically a dynamic, iconic simulation environment with a built-in development system for extensibility. EXTEND’s libraries of pre-built blocks virtually allow users to build any simulation system they can imagine. 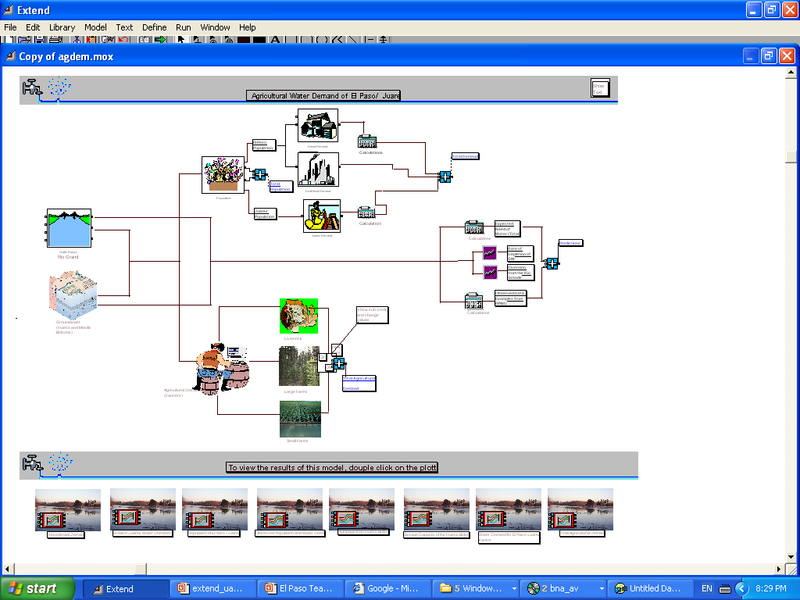 Everything needed for model building is implemented within EXTEND visualization environment. The area of interest is a desert community that lies within two states and two countries (Figure 1). The twin-cities are at the center of the stretch of the Rio Grande-Rio Bravo River from Elephant Butte Reservoir, New Mexico, to Fort Quitman, Texas-90 miles downriver from El Paso-Ciudad Juarez. The water supply for this region comes from three sources: the Rio Grande, the Hueco Bolson Aquifer and the Mesilla Bolson Aquifer. The Hueco-Mesilla Bolsons Aquifer, located east and west of the Franklin Mountains in Far West Texas, is recognized as a major aquifer in Texas. 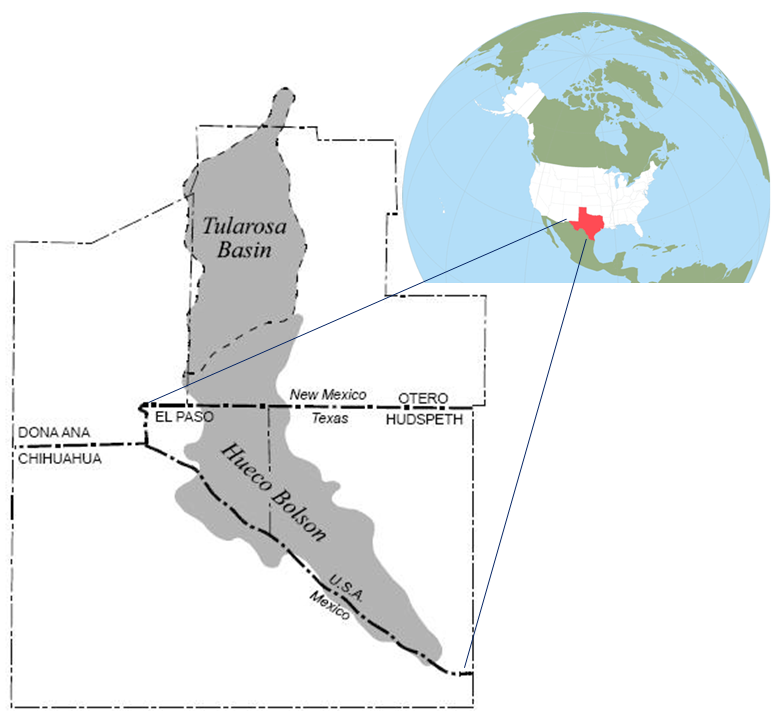 The Hueco Bolson is the principal aquifer for the El Paso area and Ciudad Juarez in Mexico − nearly 90 percent of the water pumped from the Mesilla and the Hueco bolsons in Texas is used for public supply. The aquifer is composed of basin-fill deposits of silt, sand, gravel, and clay in two basins, or bolsons: the Hueco Bolson, which has a maximum thickness of 9,000 feet, and the Mesilla Bolson, which has a maximum thickness of 2,000 feet. Although the Hueco and Mesilla bolsons share similar geology, very little water travels between them. The upper portion of the Hueco Bolson contains fresh to slightly saline water, ranging from less than 1,000 to 3,000 milligrams per liter of total dissolved solids. The Mesilla Bolson also contains fresh to saline water, ranging from less than 1,000 to 10,000 or more milligrams per liter of total dissolved solids. Its salinity typically increases to the south and in the shallower parts of the aquifer. In both aquifers, declines in water level have contributed to higher salinity. This case study took place in the Rio Grande valley which is the fastest growing region in the United States. Water in the southwest can act as a break on the economic development of this region. Many reports indicates that water conservation is a quick and relatively easy solution to meet the needs of this region. Water conservation and water quality protection must be a vital concern of all jurisdictions of this region. At some unspecified point in the distant future, depending on the availability of low-cost energy, desalination could allow some of the reservoir of brackish water in the aquifer to be utilized. Some other alternative sources is to increase the use of the Rio Grande, increase water rights to the Mesilla Bolson, expansion of recharge into the Hueco Bolson aquifer, and water re-use. All of these options were used in the current case study. The present work is basically a communication, awareness and data management tool. The model was structured into three main sections of hierarchical blocks: population, water demand and water supply (Figure 2). From these sections, the Hueco Bolson storage level was determined. Three plotters were then used to plot demand, population and Hueco Bolson Storage levels. There were many variables in the model. In general, the variables were broken into one key dependent variable, the Hueco Bolson Storage level and two key independent variables: 1) El Paso and Juarez water demand and 2) two water use scenarios (current water supply with no conservation and future water supply with conservation). These key independent variables can be selected on the upper left and right of the model interface depending on the demand scenarios. Other independent variables include El Paso and Juarez populations, water demands in gallons per capita per day and finally the water supply sources (groundwater from Hueco and Mesilla Bolsons, surface water from Rio Grande and water re-use, and conservation efforts). Findings indicate that demand for water in the El Paso-Ciudad Juarez region is high on both sides of the border. Projected population growth for the next years indicates that the quantity of water demand for both industrial and municipal use can be expected to increase, causing additional pressure to the region’s already stressed water supply. In the El Paso-Ciudad Juarez area, ground-water satisfies the bulk of municipal water needs, while surface water is primarily directed toward irrigation. Most of the aquifers are being depleted at a rate faster than the rate of recharge. The water supply in the area of interest is obtained from the following sources: 43% from the Rio Grande, 40% from the Hueco ground water basin, and 17% from the Mesilla groundwater basin. Through purchases of rights to agricultural water, El Paso had increased its supply from the Rio Grande to meet half of its total needs. These supplies are only available during the irrigation season, after which flows are readily diminished and poor water quality prevents their use. In addition, directly across the Rio Grande, Ciudad Juarez, Mexico, with an estimated population of more than 1.5 million, is extracting local ground water from the Hueco Basin faster than it can be replenished. Since pumping water from the Hueco aquifer is occurring faster than it can naturally be replenished, it is expected that the Texas portion of the Hueco will be exhausted of all fresh water by about the year 2025. If additional surface waters are not made available to supplement drinking water supply, the critical water shortages in the region will likely lead to severe health and sanitation problems. With respect to the residential sector, landscaping was the first sector to impact the residential consumption (Figure 3 and Figure 4), whereas the finding of the agricultural water consumption is still in progress. This work was a part of decision support toolkit. The presented model and associated toolkit is helpful to communicate data and findings to decision makers in a user-friendly fashion and they can test different scenarios. Such a toolkit is important in other arid regions like the Arabian Gulf Cooperation Council Countries. This Toolkit is developed to assist interested individuals, stakeholders, workgroups and decision makers in understanding the unique characteristics of the region within 100 kilometers of the US/Mexico border. This CD and interactive toolkit will better coordinate activities of those dedicated to the border by quantifying critical indicators of need and emphasizing the importance of sustainable development planning. The Toolkit includes a customized series of programs including Geographic Information Systems, interactive models and applications integrated into a suite of functions that attempt to turn data into information. It is a part of an on-going effort to improve data collection and overall understanding of the unique characteristics of the border and the challenges stakeholders face. It is important to note that this model has been developed to serve only as a preliminary screening tool. This modelling exercise is important because it enables users to 1) predict the course and results of certain actions; 2) explore the effects of modifications; 3) gain insight and stimulate creative and critical thinking; and 4) communicate the integrity and feasibility of the plans. As for the disadvantages, it doesn’t have any options to generate governing equations. Users have to use standard governing equations, or analyze data and find associated relations using different tools. The previous case studies resulted from a team work efforts, I was a member concerned about EXTEND modeling that emphasize on agricultural water consumption among other e.g. remote sensing of salt affected soils and the water hydrochemistry. The work was executed at the Center for Environmental Resource Management (CERM) of the University of Texas at El Paso, and presented to The Border Environment Cooperation and Commission (BECC) and the Southwest Center for Environmental Research and Policy (SCERP). Boyle Engineering Corporation, 1991. El Paso Water Resource Management Plan, 1991–2040. Report prepared for El Paso Water Utilities Public Service Board and El Paso County Water Improvement District No. 1.